The serendipitous acceptance of imperfection in a messy world, otherwise known as what happens when you forget to stop, stay still then shoot while chasing the crowd down the street. Love the effect you have going in this. Distractions, busyness, such a great energy, Patti! 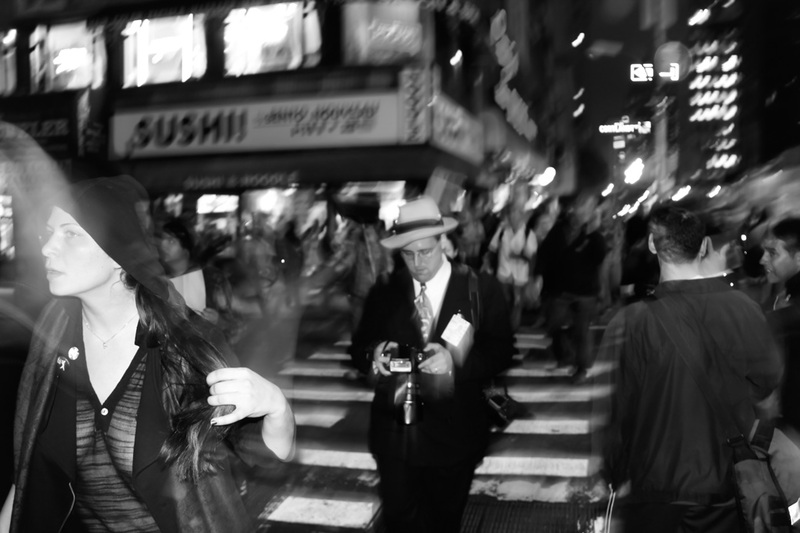 A very dynamic New York shot, with a nice reportage feel to it, Patti. Brilliant photo – love the movement surrounding the guy and you captured his activity very well! Well done! Love this photo, it’s alive! You have me actually walking WITH you in this shot. Fantastic! Out of focus can sometimes be really great, like this photo. I love the man/main character…but wait…is he the main character, or is the woman on the left? I love the light on her and her face is beautiful. This one is really brilliant! Were you back in the 1940’s? Just look a Scoop there with his camera; ready to get the Pulitzer. My albums are choked with the messy results of times when I forgot to stay still. But you manage to tun even out of focus into art! Brilliant indeed Patti. What a masterpiece once again Patti. Thanks for sharing this inspirational post. The unpredictable and fascinating flow of life. Blurry, but still a good photo. Sometimes blurriness can add to a photo. Works beautifully. The woman in the foreground adds a lot of interest, too. Love it.